With the sun shining brightly through the stained-glass windows of Christ’s Church Cathedral in Hamilton, Susan Jennifer Anne Bell became the first woman ordained to serve as coadjutor bishop of the diocese on Saturday, May 5. The sweet aroma of Indigenous sacred medicines wafted around the Cathedral as more than 600 people gathered to pray and take part in the historic ordination. The service was also live streamed on Facebook and watched by peopled from across the diocese and around the Anglican Communion. “Go to the world and offer the light of Christ to all we meet,” said Bishop Bell in brief remarks during the service.” Known as a strategic, mission-centred leader, Bishop Bell says she intends to listen and watch for where God is at work in the church and the world and then to come alongside that work. 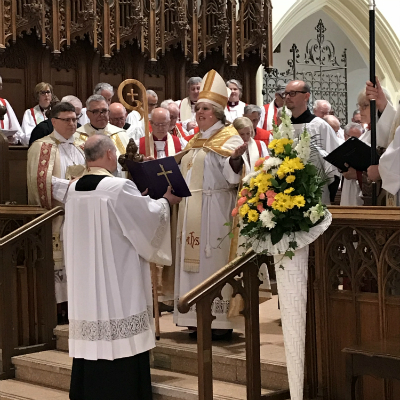 Archbishop Colin Johnson, metropolitan of the Ecclesiastical Province of Ontario, presided and acted as the chief consecrator during the two-hour service. More than a dozen bishops, including the Primate of the Anglican Church of Canada, Archbishop Fred Hiltz, were in attendance. Throughout the service, the Paschal candle burned in honour of the life and ministry of Canon Robert Fead, who tragically died earlier in the week. The clergy and people of the diocese elected Bishop Bell on the fifth ballot of an episcopal election that took place on March 3. After a brief transition period, Bishop Bell will succeed Bishop Bird as diocesan bishop on June 1, 2018, becoming the twelfth Bishop of Niagara and first woman hold this office.